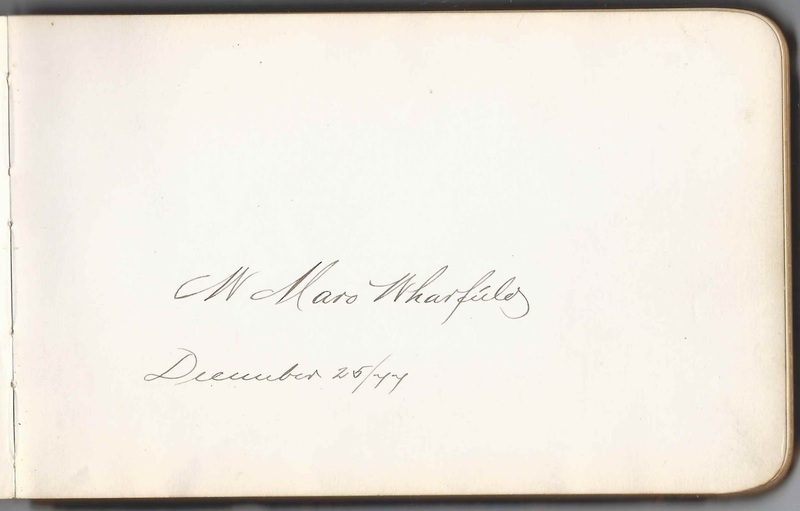 1877-1881 autograph album that belonged to Wilfred Maro Wharfield of Holyoke, Massachusetts. Many of the pages were signed by his classmates at Holyoke High School. Wilfred Maro Wharfield was born October 27, 1863 at Dalton, Massachusetts, the son of William Henry Wharfield and Persis (Jordan) Wharfield, who were born at Blandford, Massachusetts, and Cummington, Massachusetts respectively. Persis died on October 30, 1867 at Dalton, Massachusetts. On August 19, 1868 at Westfield, Massachusetts, William Henry Wharfield married Charlotte E. Dickinson, daughter of Samuel and Clarissa Dickinson. Charlotte was born January 22, 1843 at Brecksville, Ohio. William and Charlotte signed pages in Wilfred's album, William on Christmas Day in 1877 and Charlotte the day later. They had presumably given the album to Wilfred as a Christmas present. Wilfred's brothers also signed pages in his album. 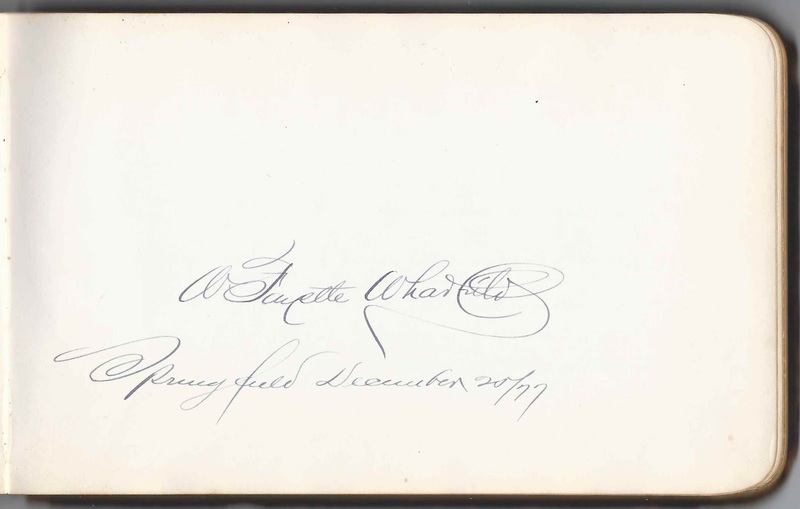 Wesley Fayette Wharfield, who was born July 5, 1848, signed a page at Springfield, Massachusetts, on that Christmas day in 1877. 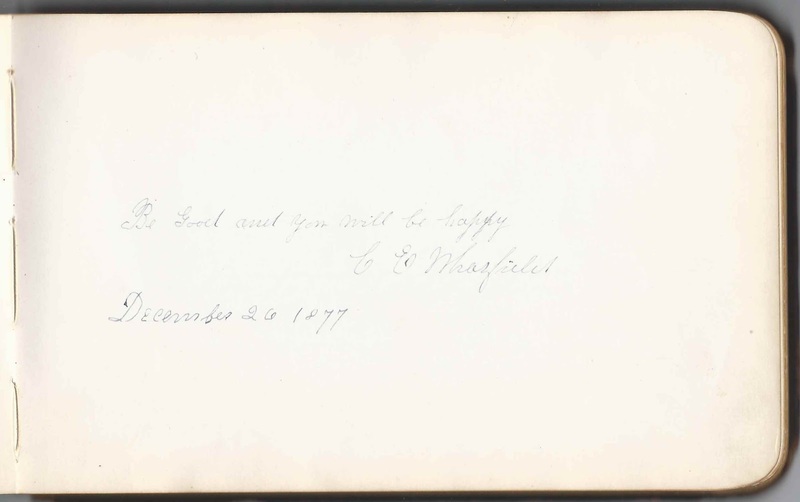 Williston Clifford Wharfield of Holyoke, Massachusetts, who was born December 21, 1853, signed a page on January 9, 1878. 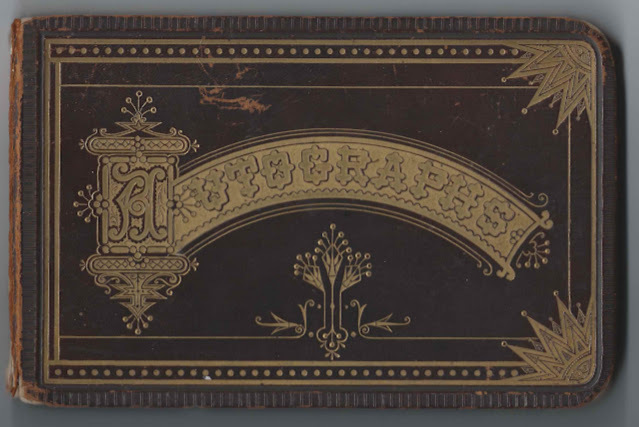 Wilfred had an older sister, Emma Augusta Wharfield, born August 31, 1846, but she had died by the time he received the album. Emma died about May 1868, less than a year after the death of the siblings' mother Persis. There was also a half sister, Louisa Adelaide Wharfield, daughter of William Henry Wharfield and his second wife Charlotte E. (Dickinson) Wharfield, but she didn't sign a page in the album. On November 14, 1888 at Holyoke, Massachusetts, Wilfred Maro Wharfield married Frances Isabella Tremere, daughter of William Thomas Tremere and Eleanor (Booth) Tremere. Frances was born about 1859 at Kingston, Ontario. 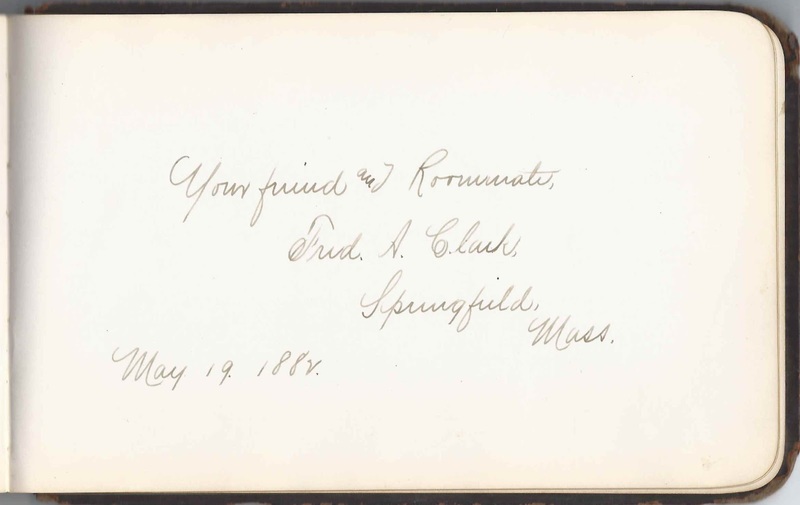 After graduation, Wilfred apparently moved to Springfield, Massachusetts for work; his roommate there, Fred A. Clark, signed a page on May 19, 1882. Ethel Kay Wharfield, born December 21, 1890; graduated from Wellesley College in 1915; married Charles W. Hutchinson, M.D. Read more about the Wharfield family, back to Revolutionary War patriot Reuben Wharfield here, from the "Encyclopedia of Massachusetts - Biographical - Genealogical", Volume 10. As mentioned above, two of Wilfred's classmates at Holyoke High School were natives of China brought to the United States by the Chinese Educational Mission, whose purpose was to educate promising Chinese students in mathematics and engineering. 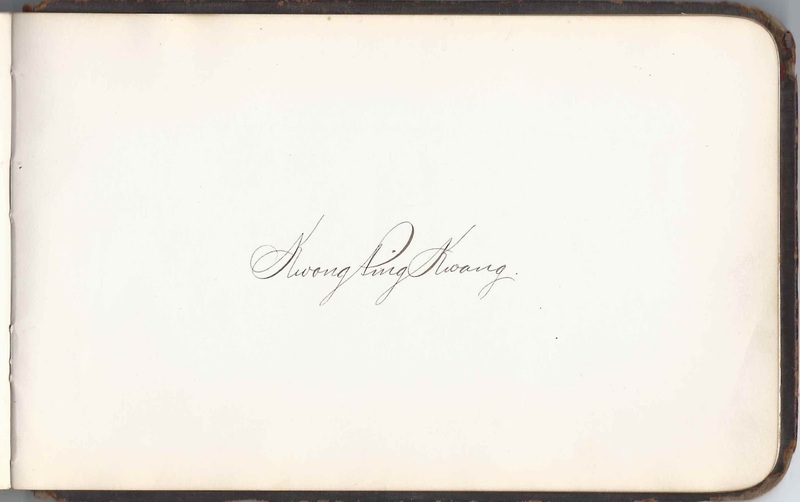 They were Chow Wan Pang and Kwong Ping Kwang, both of whom returned to China after their U.S. education and worked in various fields. 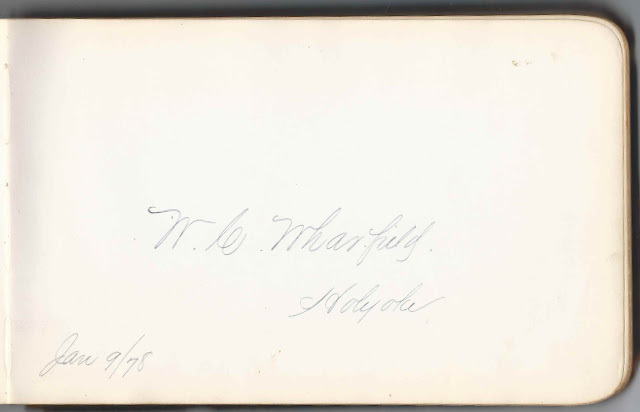 Mrs. George A. Ayers of Holyoke, Massachusetts, signed on "2-10-78"
Linda R. Brooks, signed at Holyoke, Massachusetts, on January 6, 1878; presumably the Linda R. Brooks who married James E. Ball at Holyoke, Massachusetts, on 4 October 1882. George Eliot of Chicopee, Massachusetts, signed on February 2, 1877; S.C.I. 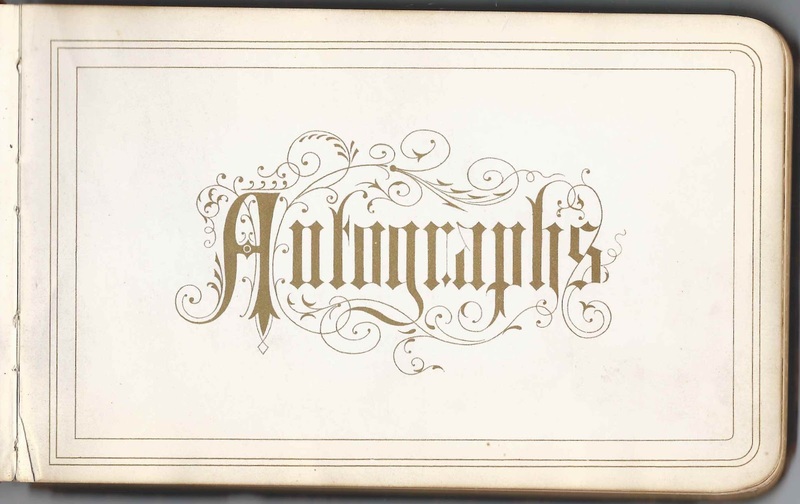 Ellie L. Farnum of Holyoke, Massachusetts, signed on June 23, 1881, Class of 1881 at Holyoke High School. She was Ellen L. Farnum, daughter of Hiram and Laura Farnum. 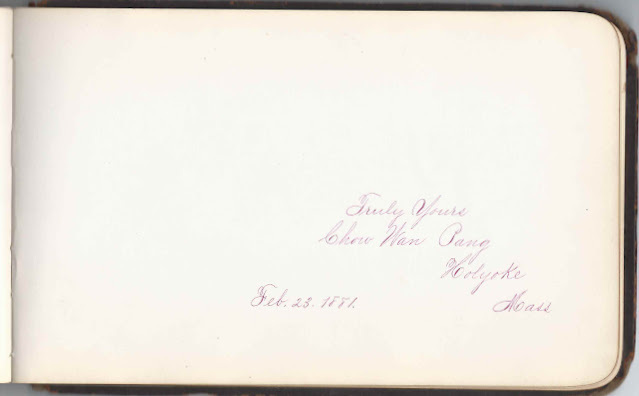 Catie E. Gibbs, Class of 1881, Holyoke High School, signed on February 25, 1881; presumably the daughter of Charles Wesley Gibbs and Emeline (Brown) Gibbs. Lizzie A. Stebbins, signed at Holyoke, Massachusetts; "Nobody's Child"
W. A. Tuttle of Holyoke, Massachusetts, signed on February 21, 1881; presumably Walter Augustus Tuttle. Wilfred Maro Wharfield, signed on December 25, 1877; album owner who presumably received the album as a Christmas present. W. Fayette Wharfield, signed at Springfield, Massachusetts, on December 25, 1877; Wilfred's brother Wesley Fayette Wharfield. W. E. White of Holyoke, Massachusetts, signed on April 18, 1881; his wife signed the right facing page. Possibly William E. White, born about August 1847 in New York; married Priscilla A. Johnson of Quebec about 1878. They lived at Holyoke, Massachusetts. Mrs. W. E. White of Holyoke, Massachusetts, signed on April 18, 1881; her husband signed the left facing page. Possibly Priscilla A. (Johnson) White, a Quebec native who married William E. White; they lived at Holyoke, Massachusetts.